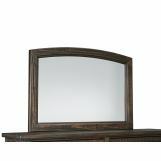 All solid Pine wood construction, finished in a weathered golden-brown hue with subtle wire brushing and varying natural distressing. 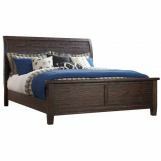 The bed offers a sleigh headboard and a footboard — both featuring lateral slats. 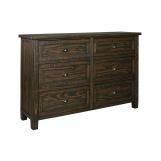 The cases have generous storage with framed inset drawers and framed sides, all supported with robust leg posts. 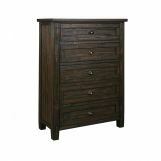 Drawer boxes are dovetailed and fully finished with wooden center glides for smooth function. The metal bin pull hardware nicely accents the wood finish.